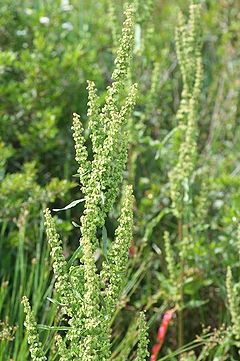 Also Known As – Rumex crispus, curled dock, garden patience, narrow dock, and sour dock. Overview - Yellow dock is commonly found growing along roadways in ditches and other waste land. It grows up to three feet tall with rusty brown and green leaves. It is also known as Curled Dock because the leaves have ruffled edges. We harvest our Yellow Dock Root on the banks of the Nisqually River at the base of Mt. Rainier. Medicinal Uses – Internally, Yellow dock is considered one of the best overall blood purifiers. It is often recommended for anemia resulting from an iron deficiency. Yellow dock extract's rich iron content helps to enrich blood quality, and provide important vitamins and minerals, more than any other plant. It is also high in bio-flavonoids, which help to strengthen capillaries, and because it improves absorption of nutrients it is an effective herb in the treatment of acne and dermatitis conditions. Yellow Dock mobilizes congested blood and yanks toxins from the body's tissues. It is used to cleanse the system of toxic wastes and to help relieve virtually all disorders associated with impurities in the blood. Normally, Yellow Dock is blended with other cleansing herbs, like Burdock and Goldenseal to eliminate toxins and foreign substances that can overburden the liver; the herb is quite useful for treating a wide range of ailments. By significantly reducing the toxic content in the body it becomes easier to heal acne, boils, eczema, psoriasis, hives, dermatitis, as well as fungal infections and blood disorders. Yellow Dock tincture used to aid digestion and its laxative effects promotes colon health, easing constipation, clearing bodily wastes and improving skin eruptions caused by the condition. Yellow Dock extract's rich iron content helps to enrich blood quality, more than any other plant, as well as varying amounts of vitamins and minerals. Yellow Dock is also used to treat limp and brittle hair, fingernails, and improve the skin's natural qualities. Externally, it can treat cuts, rashes, swellings, burns, boils, wounds, bleeding hemorrhoids and bites from digs and insects. It can also relieve the sting of nettles. Other Uses – Yellow dock can be added to soups or eaten as cooked greens to increase iron, vitamins, minerals and bio-flavonoids in the diet. Herbs to Combine/Supplement - Combined with red clover, dandelion, cleavers and burdock, the mixture of herbs makes a good internal treatment for eczema, acne, poison ivy and psoriasis. Parts Used – Leaves and roots are both used in medicinal remedies. The roots are harvested in late summer or autumn and prepared in ointments, decoctions, tinctures and herbal teas. Precautions - Some people experience mild diarrhea when taking yellow dock. If you start having abdominal pain, nausea or vomiting, call your doctor. Do not take if you take medications that decrease your blood calcium like diuretics or Dilantin. Also, do not use if you have kidney or liver disease or an electrolyte imbalance. If you have disease of the gastrointestinal tract like esophageal re-flux or diverticulitis, avoid this herb. If taking as a laxative, do not use for longer than one week at a time. Suggested - Yellow dock can be taken as capsules, herbal tea or tincture. Dock is high in iron, and can be taken as tea several times per day treat anemia. Its very good product happy with it. Quick and accurate! Thank you! Click the button below to add the Yellow Dock Root to your wish list.